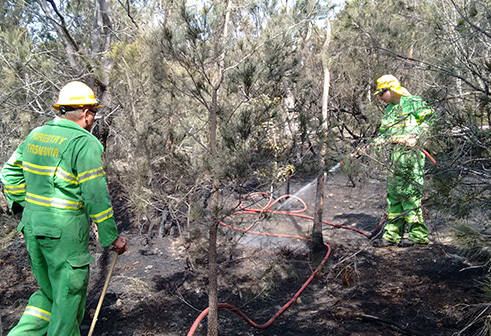 Fire is an essential part of the health of native bushland. Many plants and animals depend on fire for their long-term survival. After the planned burn is completed, pockets of unburnt vegetation will remain and provide habitat for fauna. The burnt area will provide for flora to re-sprout e.g. eucalypts and allow plants that require fire to re-seed e.g. banksias and hakeas. The land will look black in the places where the vegetation has burnt. The pockets of unburnt land will remain as they were before the fire, providing a mosaic in the landscape. Whilst burnt areas may appear to be devoid of habitat for fauna, fuel reduction burns can create new habitat in the form of holes formed by burnt out tree stumps and enlargement of tree knots for animals like bats. The area that has been burnt will be patrolled to minimise the risk of the fire flaring up again. It is best to avoid the area until patrolling of the area has ceased. The planned burn may expose hollows and make the ground uneven so care must be taken when walking over the land after patrolling has ceased. Trees can be structurally weakened by the fire and there may be a risk of branches or the tree itself falling so it is important to be aware of this. Vegetation regrowth after the burn will change over time. Species reliant on fire to re-generate appear quickly but are eventually outcompeted by those species that recover from fire more slowly. Once this steady state is achieved provided land owners continue their weed management program. Part of the Fuel Reduction Program is to record and analyse the amount of land burnt, its location and how quickly fuel loads re-appear. Careful consideration is given to the interval of burning land for ecological (e.g. re-generation) purposes and for fire safety. This will guide when future fuel reduction burning can occur.